Conjunctival melanocytic tumors comprise benign and malignant neoplasms. Nevi are congenital benign melanocytic tumors that can be further classified into junctional, subepithelial, compound, and blue nevus as well as congenital melanocytosis. In the text, the term “nevus” refers to the most common form of nevi, the compound nevus (a nevus with a junctional and a subepithelial component). For further information regarding blue nevus, congenital melanocytosis, and other kinds of nevi ophthalmological textbooks are recommended. Primary acquired melanosis (PAM) can either be regarded as benign (PAM without atypia) or represent a precancerous lesion (PAM with atypia), whereas a melanoma is per definition a malignant melanocytic tumor. Patients usually present for an eye examination when they recognize a new or growth of a preexisting lesion. The clinical diagnostic process comprises slit lamp and fundus examination, sonography or anterior segment OCT (if necessary), and photo-documentation. Conjunctival melanocytic lesions can appear pigmented (brown), tan, or non-pigmented. Nevi (Fig.1A) exhibit usually cysts (that can be detected on slit lamp examination and with sonography/anterior segment OCT) and are reported by the patient to exist for a long time (as they are congenital). usually occurs in middle-aged individuals (mostly Caucasians). The lesions appear pigmented, are usually unilateral, and may become thickened over time. Biopsy is recommended to define the appropriate treatment strategy dependent on the histological picture and the extent of the disease. Conjunctival melanomas (Fig. 3) may arise from PAM (most common), nevi, or de novo. Increased vascularity and adherence to the underlying sclera may be present. Melanomas are like PAM more frequently observed in Caucasians and exhibit a nodular or diffuse growth. Suspicious lesions have to be completely excised and submitted for histopathological investigation. Once the diagnosis is confirmed, systemic work-up is required. 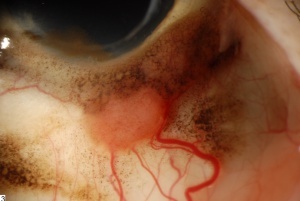 Inspection of all ocular structures is mandatory as multicentric lesions can occur, especially if associated with PAM. Lesions consisting of PAM and melanoma are also not uncommon (especially as a melanoma can arise in PAM), thus all suspicious lesions have to be excised and submitted for histopathological investigation. ally consists of nests of nevus cells that are present in the junctional and subepithelial area of the conjunctiva. Conjunctival inclusion cysts are characteristic for nevi and may be observed clinically. A PAM (Fig. 2B) without atypia is best characterized by minimal melanocytic hyperplasia along the basal epithelial layer of the conjunctival. PAM with atypia shows usually isolated or confluent nests of atypical melanocytes. Pagetoid spread can also be observed. The melanocytes exhibit varying signs of atypia as large abnormal cells, prominent nucleoli, a high nuclear-cytoplasmic ratio, and mitotic figures. 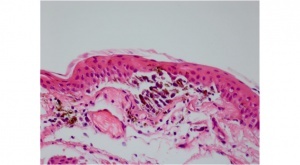 A conjunctival malignant melanoma shows invasion of melanoma cells into the subepithelial layers. The cells exhibit the above named signs of atypia. Remnants of PAM or nevus may be found in or contiguous to the melanoma. There are some lesions that cannot be unequivocally assigned to a nevus, PAM, melanoma. These lesions are best classified as “Indeterminate melanocytic proliferations of the conjunctiva”. Nevi may be excised when growth or change in color is noted. These changes do not necessarily - but can - indicate the development of a melanoma as hormonal changes, inflammation or even growth of the mucinous inclusion cysts can be mostly accused for these changes. In most cases nevi can just be followed including photo-documentation. Lesions suspicious for PAM should be carefully biopsied (incisional, excisional, or map biopsy using a “dry” technique) allowing for histological examination. Dependent on the clinical impression, the surgical margins can be treated with cryotherapy. 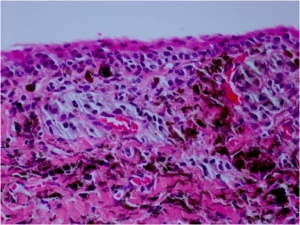 Treatment with topical mitomycin or interferon alpha 2b can be considered for histology-proven PAM with atypia including residual lesions - but only for lesions confined to the epithelium as these local treatment strategies are not proper for melanomas. Malignant melanomas should be completely excised using “no touch” techniques. Extensive resection may be required. Adjunctive cryotherapy and additional treatment (e.g. brachytherapy) can be also employed. Sentinel lymph node biopsy should be considered for lesions thicker than 2 mm (Breslow equivalent). Nevi are usually stationary but can exhibit growth due to hormonal changes or local inflammation. They should be observed for growth or change in color. PAM without atypia may be followed by observation. 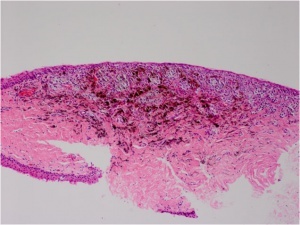 PAM with atypia require - after treatment - periodical follow-up by an experienced ophthalmologist to rule out recurrence or progression into malignant melanoma. Patients with conjunctival melanoma should be periodically followed and investigated for local recurrence. Systemic work-up is also mandatory. Nevi are congenital lesions and only a small percentage progress into malignant melanoma. PAM with atypia has a high likelihood (approx. 13%) to progess into malignant melanoma in contrast to PAM without atypia. 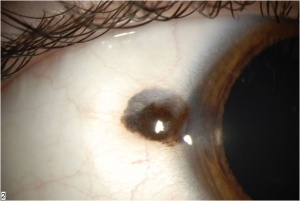 Conjunctival melanomas have a risk (20-50%) of local recurrence. Melanoma-related mortality at 10 years ranges from 13 to 38%. Lesions that involve the fornix or the palpebral conjunctiva have a higher risk for metastasis and locally aggressive disease than bulbar lesions. Caruncular disease has the worst outcome, may infiltrate the orbit, and is associated with 50% mortality at 3 years. An increased mortality is also seen with lesions thicker than 2 mm (Breslow thickness). Melanomas arising de novo seem to carry a higher risk of metastasis and death compared with those cases arising from PAM or nevus. Boyd K, Vemulakonda GA. Nevus. American Academy of Ophthalmology. EyeSmart® Eye health. https://www.aao.org/eye-health/diseases/nevus-list. Accessed March 19, 2019. American Academy of Ophthalmology. Ocular Pathology/Oncology: Conjunctival melanocytic disorders - primary acquired melanosis (PAM) Practicing Ophthalmologists Learning System, 2017 - 2019 San Francisco: American Academy of Ophthalmology, 2017. Damato B, Coupland SE. Management of conjunctival melanoma. Expert Rev Anticancer Ther. 2009;9(9):1227-39. Grossniklaus HE, Margo CE, Solomon AR. Indeterminate melanocytic proliferations of the conjunctiva. Trans Am Ophthalmol Soc. 1999;97:157-70. Shields CL. Conjunctival melanoma: risk factors for recurrence, exenteration, metastasis, and death in 150 consecutive patients. Trans Am Ophthalmol Soc. 2000;98:471-92. Shields JA, Shields CL, Mashayekhi A, Marr BP, Benavides R, Thangappan A, Phan L, Eagle RC Jr. Primary acquired melanosis of the conjunctiva: experience with 311 eyes. Trans Am Ophthalmol Soc. 2007;105:61-72. Shields CL, Markowitz JS, Belinsky I, Schwartzstein H, George NS, Lally SE, Mashayekhi A, Shields JA. Conjunctival melanoma outcomes based on tumor origin in 382 consecutive cases. Ophthalmology. 2011;118(2):389-395. Spencer WH. Ophthalmic Pathology. An Atlas and Textbook (4th edition). Philadelphia: WB Saunders; 1996. Yanoff M, Sassani JW. Ocular Pathology (6th edition). Elsevier; 2009. Ocular Pathology Atlas. American Academy of Ophthalmology Web site. https://www.aao.org/resident-course/pathology-atlas. Published 2016. Accessed January 4, 2017. This page was last modified on March 19, 2019, at 16:14. This page has been accessed 64,886 times.